Times Square in New York City is the most famous site of New Year's Eve celebrations. Photo from Times Square Alliance. Americans celebrate New Year’s Day on January 1st. However in the USA, festivities usually begin on December 31st. On the night of December 31st, Americans across the country join relatives and friends at New Year’s Eve parties. Once midnight arrives, people yell “Happy New Year” and make noise with chimes, whistles, and firecrackers. 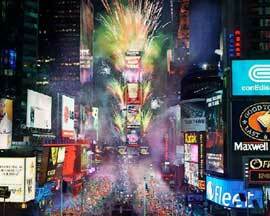 One of the largest New Year’s Eve celebrations takes place in New York City. At this celebration, thousands of people gather to watch the Ball Lowering Ceremony in Times Square where a giant crystal ball is lowered right before midnight. Most Americans count down the seconds until the new year. “3-2-1, Happy New Year!” Americans also kiss the nearest person and sing “Auld Lang Syne” in unison once the clock strikes midnight.Many Americans enjoy watching football games on television or at stadiums on January 1st. The Rose Bowl is a football game that takes place in California and is preceded by the Tournament of Roses, a giant parade. The parade extends five miles and entertains thousands of people with floats and bands. Some Americans attend religious services on January 1st. Others may make New Year’s resolutions or eat black-eyed peas for good luck in the new year.